Vest panels have hook & loop fastener behind appliqued "buttons"
"We're all babies here" That's the quote, right? Do you ever think about how weird it must be for your baby to come to be in this world of ours? First, there was the cold shock of air and his first cry. That was the first new skill that he discovered. The world was full of discoveries after that. It was a pretty exciting day when he noticed his hands, he stared at them for hours, clenching and unclenching them. Oh, and then he started to crawl, now that was really something! In a way, life as a baby kind might kind of feel like falling down a rabbit hole. There are enough amazing, surprising thing in our world that we might as well exist in Wonderland, after decades on this earth we still are sometimes shocked about the way things roll out. If you're ready to encourage that wonder in the next few years by the time your child can make his own cup of tea he just might make a wicked mad hatter. The mad hatter not only has a great sense of style, he's never going to assume that common sense is true, he's got the makings of a great philosopher. 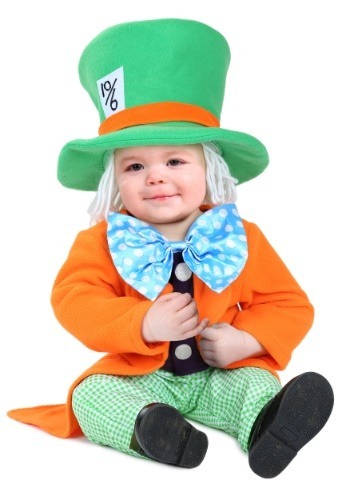 This ensemble has that crazy hatter appeal while remaining day care friendly. The ensemble features a dashing orange coat with tails, a bright blue bowtie, and a pair of dapper pants. Top it all off with the green top hat with a white yarn wig and he's ready to give Alice a hard time. Can you answer this question, "Why is a ga-ga like a goo-ga"? This is a super cute outfit! It's well made for the money and just simply darling. The sizes are more accurate than some of the stuff on here. Definitely happy with this purchase.